The ADDACS Bacs report is produced whenever a change is made to the details of an existing Direct Debit Instruction, (ADDACS is an acronym made up from the Automated Direct Debit Amendments and Cancellations Service). The report will provide information regarding the instruction and is made available to Service Users as soon as the Paying Bank have updated Bacs. The Service User then needs to act on these changes within 3 working days. It is critically important that the correct action is taken in response to an ADDACS report as this will enable the Service User to continue to receive payments. Failure to update details can lead to incorrect collections, indemnity claims, lost revenue and poor customer service. 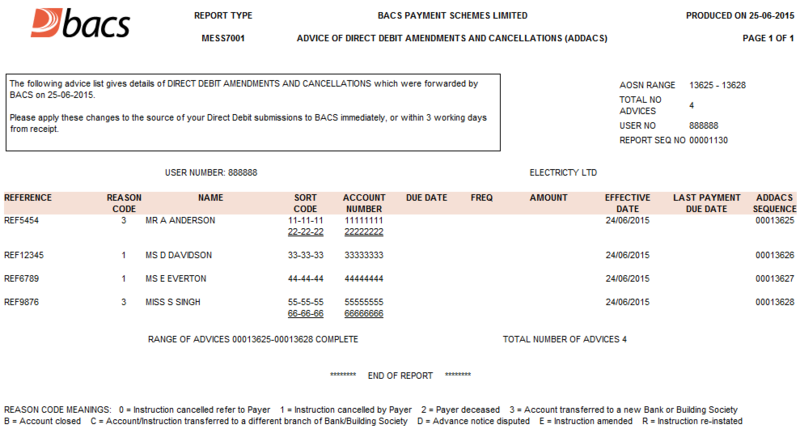 All Bacs reports are available electronically via Bacs Payment Services website and some Bacstel-IP software packages. E-mail notifications can be sent to various users when the reports become available (if set up against the contact). It’s recommended to download these using your payments software where possible. Otherwise they are made available to the service user for 37 days at a time.